children’s reading? One bookseller shared her experience when parents, booksellers, and students attempt to find the right book within a leveling framework. 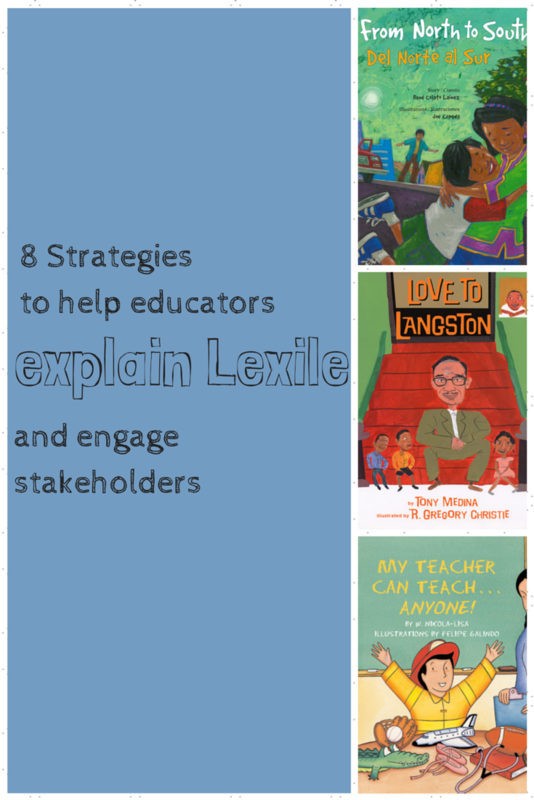 In our previous post, “7 Strategies to Help Booksellers and Librarians Navigate Lexile,” we presented strategies for the book experts out in the field on strengthening the communication lines, sharing resources and context, and building a community invested in each child’s education. In doing so, we show our students, children, and customers that they have a whole team cheering for them and invested in their growth, joy, and success. Now for educators! Want a child to achieve a year and a half of reading progress and develop a lifelong passion for learning? The more adults you have involved in your students’ success, the better chances you have for meaningful growth and creating a love of reading. 1. Don’t wait for summer break to provide reading lists. After each assessment cycle or parent-teacher conference period, provide parents with book ideas to help students get to the next level. Research or create booklists to hand parents at a parent-teacher conference. Except for the outliers, you can generally get away with making 3 lists (above-, on-, and below-grade level) of where students are reading. For pre-made lists: Literacy organizations, such as Reading Rockets and Reading is Fundamental, have created top-notch reading lists. Libraries, such as Phoenix Public Library who built its own reader’s service to search titles by Lexile, often have ready-made booklists by grade and theme and may subscribe to NoveList K–8 Plus. To create your own: Search by book titles or by levels on Scholastic Book Wizard, Perma-Bound, Lexile’s Find a Book, Accelerated Reader BookFinder, and specific publishers like Lee & Low. 2. Assume that no one knows your leveling system outside of school. Create a toolkit (that can be re-printed each year) for parents when they go to a library or bookstore. At parent-teacher conferences or Back-to-School Night, arm parents with 1) pre-made booklists (see above) 2) addresses and directions to the public library, bookstore, or community center you trust or have reached out to 3) a level conversion chart—If your leveling system doesn’t provide one, download one from Reading Rockets, Booksource, Scholastic Guided Reading Program, Lexile, or Lee & Low. 3. Hold information sessions at Back to School Night or other times in the year for parents. Explain what leveling system you are using to assess a child’s reading ability. Demonstrate how to find books at that child’s reading level when in a store, online, or at a library. “What does a such and such level book like? Below-level book? Above-level book? What should a child be able to do at such and such reading level?” With colleagues, consider another session for nearby bookstores or public librarians. All leveling systems have websites and FAQs sections addressing misconceptions and how-tos that you can show parents, librarians, or bookstore staff. 4. Find out where your students and families are going for books. My students borrowed books from the local community center or bought books at the nearby discount retail superstore. We built a community by reaching out to the children’s librarian and community center coordinator. Reaching out to these places helped me learn about my students outside of school and familiarize staff with our goals. Share any booklists and conversion charts. Libraries and bookstores will be thrilled to be a part of your community. As I said last week, students may move on, but you and book staff are in it for the long haul. 5. Extend the classroom to your local library or bookstore. When I learned where my students were looking for books (and what poor quality those offerings were at a discount store), I realized that many had not been to the neighborhood branch of the public library and did not know what the library had to offer. Post in class or send home the library or bookstore’s calendar of monthly events. Encourage families to join you at a weekend storytelling event at the library or an evening author event at the bookstore (you might be able to persuade your school to count these events as parent community service hours). Is your local library or bookstore on Pinterest, such as Oakland Public Library TeenZone? Check out your branch’s or favorite bookstore’s new releases and collections. Show families how to engage with the library or bookstore from a school computer or on a mobile phone. 6. Simulate the real world in your classroom. Many teachers organize their classroom libraries around their guided reading levels or assessment leveling system to make it easy for students to find the right book. Yet, students need experience interacting with books that aren’t leveled—as most books in bookstores and libraries won’t be. Consider organizing your classroom library by author, theme, genre, or series—or at least a shelf or bin—so students can practice figuring out the right fit book. 7. Remember: You will most likely have at least a few parents whose first language is NOT English. They will rely even more heavily on librarians and bookstore staff for help finding the right fit book for their child. The more you help librarians and local bookstores and the parents, the more you help the child. 8. Think about the message. Parents may hear that their child is at Lexile level 840 and try to help you and their child by only seeking out Lexile level 840 books. Coach parents to continue to expose students to a wide range of texts, topics, and levels. Parents may need a gentle reminder that we want our readers to develop their love of reading, along with skills and critical thinking. This may include children seeking out and re-reading favorites or comfort books that happen to be lower leveled or trying harder books that happen to be on their favorite subject. Next week, we will offer strategies for teachers and parents. What have we missed? Please share in the comments your tricks, tips, and ideas for helping families and children navigate the bookshelves.